Bugfixes in the user interface, better handling of WebDAV locks, German translation update, new Dutch and Israel holiday calendars. A number of bugfixes and usability improvements, enhancements in CSV and MS Project import/export, fixed compatibility issues with Java 10, some translation updates, new South Korea holidays calendar. Significantly improves UI scalability in High-DPI environments and fixes a few bugs. Plays better in multiscreen and High-DPI environments, updates holiday calendars for a dozen of countries, adds Ukrainian translation and updates a few others and fixes a number of bugs. Fixes a few bugs and updates Polish, French and Galician translations. 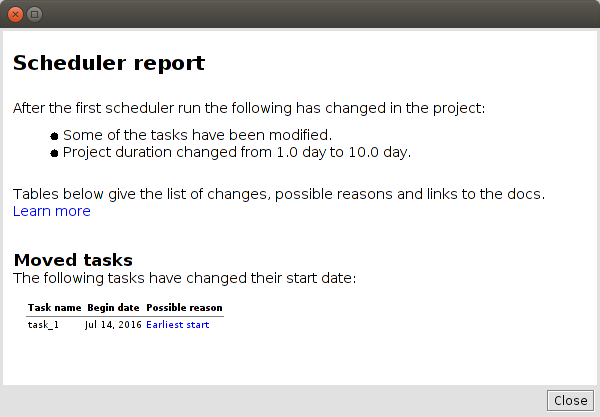 If your project is fine and the scheduler has made no changes, you’ll see no report. Otherwise the report shows up a couple of seconds after file has been opened and you need to inspect the changes made by the scheduler. There is a number of other important bugfixes in GanttProject 2.8. Korean translation has been significantly improved thanks to the efforts of anonymous translator ihavnoth, and other translations have also been updated. Distribution for Ubuntu and other Debian-based Linux systems which registers MIME type and file associations have changed MIME type from application/ganttproject+xml to application/x-ganttproject. The latter apparently already comes by default with Ubuntu so no reason to use the former anymore. File format has slightly changed: we removed redundant information about the configuration columns shown in the task table. Files produced by GanttProject 2.7 should open fine in GanttProject 2.8. Files produced by GanttProject 2.8 can be opened in GanttProject 2.7, except that only Name, Begin date and End date columns will be shown in the task table by default, no matter what is written in the project file. Any reasonably modern computer with reasonably modern OS capable of running Java applications is fine for running GanttProject. Please refer to information from Oracle or from your platform vendor about Java Runtime compatibility with your operating system. We recommend using Java 8 for running GanttProject, but Java 7 is also fine. Android and iOS are not supported. On Android you may try using Ganttman app which is file-wise compatible with GanttProject up to some extent. You may have issues when running GanttProject on devices with high-density displays.